12-year-old Ula Ložar (also known as "Uly Sky") comes from Ljubljana and attends 7th grade of elementary school. Music occupies special place in her life. She also attends 4th grade of music school playing piano. 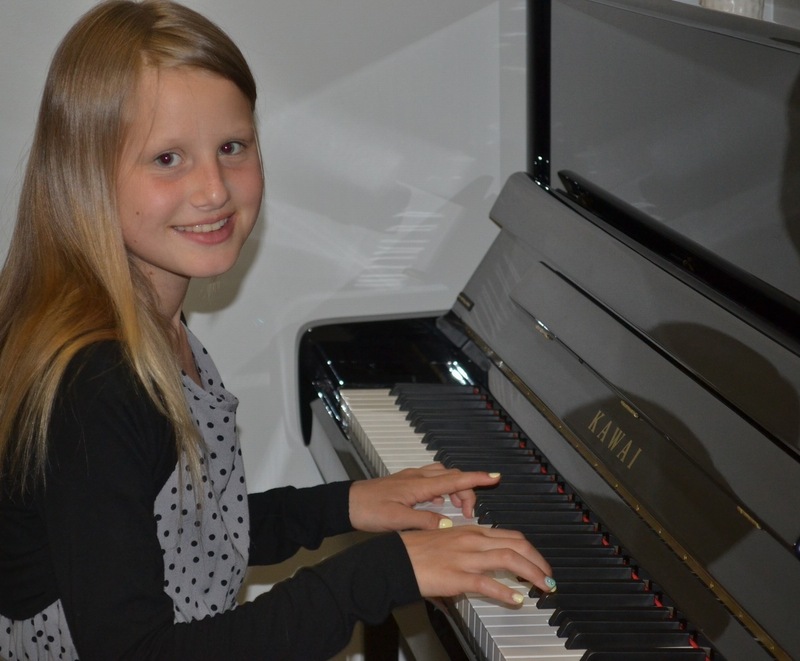 From the age of 7 she studies solo vocals with professor Marjetka Vovk in the context of music workshops Popsing. She has participated in a wide variety of vocal events and competitions. At Schools Talent contest she won 2nd place, also took part in the "Zlati Mikrofonček" festival in Bled and Slovenian elementary school contest "Korajža velja". At the festival "Europop 2014" in Hungary she has occupied an excellent 4th place in her category. In 2015 she is scheduled to take part in the festival Tra la la in Bitola (Macedonia). Here you can see Ula performing fan anthem of Green Dragons, supporters of the Olimpija branch of sport clubs in Ljubljana. Here is Ula singing "Hush Hush" of The Pussycat Dolls. Couple of more videos can be seen here. In addition to numerous contest appearances Ula also accumulates experience in studio. She has been dubbing cartoons and recorded some soundtracks for them. Ula has, like any teenager, many hobbies. She likes crochetting and knitting, painting on canvas. She also likes to cook, and has also attended a cooking contest of primary schools. 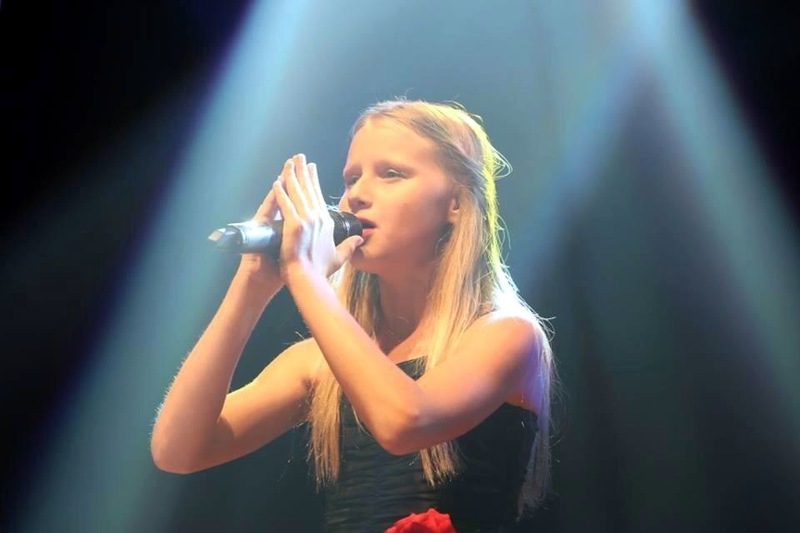 Her role models are singers Jessie J, Beyonce, Little Mix and Fifth Harmony and personal favourite from last year's JESC was Gaia Cauchi from Malta. Since she listens to music a lot, she continues to be fascinated by female singers who can hold the highest notes and appreciates their melodies, stage presence, success stories and style. Ula's parents offer her full support and understanding in her singing experiences. Ula Ložar was chosen for the contest after auditions, that took place in early September. Her participation has been confirmed on September 16th. 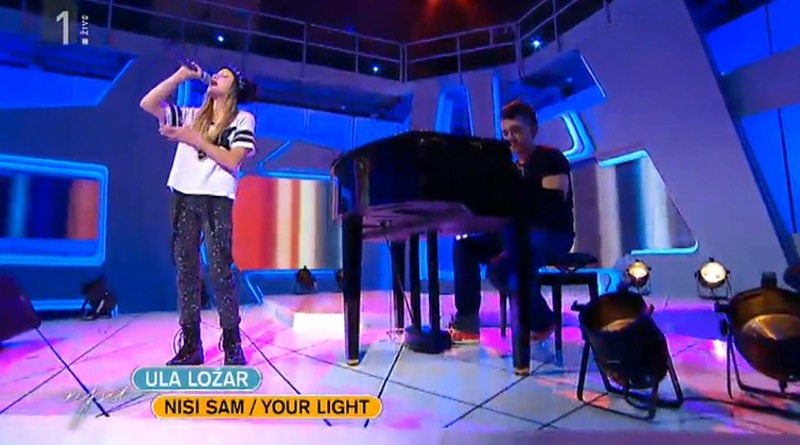 The song "Nisi sam - Your Light", which Ula will perform in the competition and on which she has also worked as author with help of Raay and Marjetka Vovk (while the lyrics were written by Erika Mager, Lucienne Lončina and Raay) was produced by Raay and was premierred on October 5 in a talk show "Nedeljsko popoldne z Ulo". Raay also was the composer of this year's Eurovision entry "Spet / Round and Round" of Tinkara Kovač. "Keep your fingers crossed for Slovenia, for it is the first time for us! I hope you feel the message contained in the song even though you may not be able to understand all the words." - Hi, Ula, and first of all our congratulations for being chosen Slovenian representative at Junior Eurovision. We've seen your first reaction when you learned the news and you seemed to be totally overwhelmed with emotions. What are your feelings now about going to JESC? - I'm really looking forward to my performance on JESC and I am excited and all happy about that. The team from RTV Slovenia, composer and producer Raay, vocal coach Marjetka, my parents and me have decided to dedicate this one month that we have to really intense preparation. But it's also really exhausting cause I want to be perfectly prepared and we have a very tight schedule of rehearsing and vocal lessons every single day. When not rehearsing I am performing on different occasions – from charity events, school events, TV performances. There is no free time for me this month. And of course the school obligations are as important as singing. And I enjoy in every single thing! That's a priceless experience and good preparation for the big stage. - Can you tell us more about your song "Nisi sam - Your Light", what is the message of it? - It's about empathy, friendship, love. And how we are never really alone. How we should help each other and we can count on each other when rough days come. - How was it created, how you were involved in the process yourself? 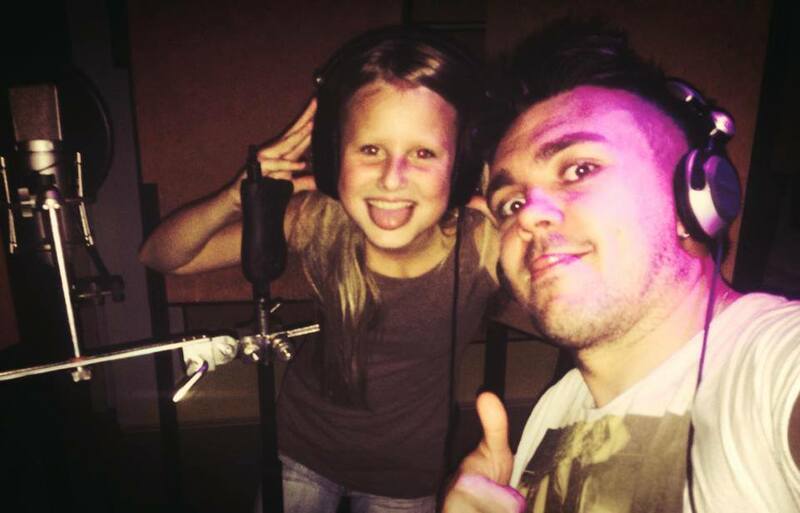 - My producer Raay and my vocal-couch Marjetka involved me in creating music – melody. We were creating in the way that I sang every single note and changed it a little bit in my own way so that we found the melody and the song that fits my voice perfectly – from low range to high notes. It was really fun to do the song in this way and I can really feel I am a part of this one. Especially I enjoyed doing the parts after first chorus and the improvisation. It is totally mine and they were both amazed when I first suggested this part (smile). - I believe it wasn't your first collaboration with composer Raay, have you worked together before and may be there are even plans for the future? - As a student of Marjetka's (Raay's wife) workshop class "Popsing" I was involved in our little teen band-aid project and song "Vprašaj nocoj srce" and I have recorded around 30 songs for cartoons with him before that. I am really satisfied with our collaboration. I never thought I could write the melody – I didn't know I have this in me and of course I am impressed how they both encourage me to create melody and music, I was so surprised and can't wait to see what's next. - How would you try to present the message of your song in your stage presentation? Will there be any backing singers/dancers? - I will be alone. I am used to perform alone and the song is minimalistic, very modern and all the unnecessary equipment on stage (dancers, set props etc) would just ruin the modern moment and feeling that the song has and would take away attention from the song and my singing. I believe that when the song is strong enough, no circus around it is needed and I am not a big fan of this kind of performances – when I'm performing, of course. - And have you chosen your outfits already? What would you like them to be - casual or something gorgeous? - You will be the first entrant from Slovenia in the contest, but we believe you've seen few previous competitions, any personal highlights there? - I have briefly checked few previous contests and I think this year is the best year so far. The best songs. I precisely checked last year's winner from Malta and Gaia has such an amazing voice and I really like her! - We believe you've met Tinkara Kovac, has she or any other former Slovenian ESC representatives given you any advice for the Junior competition? - When I am on stage, I am overwhelmed by energy of the audience. I calm down and relax with their positive energy. Only when I sing a song that I just learned for the first time – it's always a horrible feeling. - I already have when they were released, I am currently awaiting for the countries that haven't released the songs yet. - It's gonna be such a big experience and great reference for upcoming festivals in different countries. My aim is to be prepared not 100%, but 200%! - Beside being selected to represent Slovenia at JESC, I would say that the 4th place in my category at EUROPOP festival in Hungary this year. - What is your other music repertoire made of? Do you have other original songs in it? - It depends on how I feel on the day that I am performing. The most important is that I enjoy the song and that it fits perfectly to my voice, my interpretation and this style of singing that I try to develop. - A lot of effort is needed of course to combine everything. If I can be honest I am not the most thrilled going to school but I am good student and I always learn what I have to learn and my grades are good. The hard work is needed on all levels – from music to school even if it's not fun all the time. - You seem to have quite lot of different hobbies. Do you consider any other career besides singing? I really love to crochet and I hope that I will have a shop with crocheted items one day. I also love to paint but I don't think my paintings are beautiful enough to sell them one day. One says that I have talent for abstract paintings but when I paint a car or something from real life, I am not sure everyone would recognize it. - Thanks for the interview, good luck with your preparations and see you soon in Malta! Prior to her departure to Malta, Ula will take part on November 8 in "Moja Slovenija" program on RTVSlo 1, starting at 20:00. Watch the video here. She will present there 100% Slovenian version of her song. Her recorded appearances will be also aired next week at "Slovenski pozdrav" on November 14, 20:00 and "Tednik" on November 10, 20:00. Check the latest RTVSlo report on Ula's preparations here. Meanwhile, Ula's classmates have decorated her school with greetings and wishes of success in Malta. "I'm rehearsing my song every day. We're practising with Marjetka Vovk, we analyse and try to fix and improve those things that are not very good. We understand each other very well", says Ula in her new interview to Slovenian Eurovision website Evrovizija.com. She says she will try her best to be relaxed during the performance. "If I'm calm, I feel good. Before the performance I may be a bit scared, but when I get to the stage, I forget my worries. A little stage fright is a must have. Moreover, it also depends on the competition. I do not have stage fright before a national performances. I remember that at one of the performances I stood on the stage, under which was the water. I saw it and I calmed down. This has helped me. Since then, I repeatedly try to imagine the water to calm down. Water helps me to relax. First of all, I was a little scared because I'll be on the stage on my own. But then adults told me how everything goes, how it will be. I talked already with singers who have experience. Now I can't wait going on the stage for the big performance". "My outfit will be prepared by Vesna Mirtelj or Vesnish. For now, there are two ideas, both of which I like very much and myself I can not decide. We will decide together with Marjetka, Raay and the team from Slovenian TV. However, I do not want to make the dress the most important thing. I would like to make people to listen first of all to my voice and song"
Slovenian delegation is departing to Malta on November 9. On the 2nd of November Ula Ložar will be making another guest appearance on the programme NPU on RTVSlo 1, hosted by Ula Furlan, where she will give first live TV performance of her contest entry "Nisi sam / Your light". She will also be able to meet and chat with Eurovision 1995 and 1999 entrant Darja Švajger who will be another guest in the show. The show airs from 17:20 to 18:40 CET and can be seen live here. Watch Ula's performance in the show here (starts 1:12:00) or here. Short clip of Ula performing at Študentska arena in Ljubljana. You can find the schedule of the upcoming performances of Ula on her Facebook page. It includes performances on opening of renovated showrooms and 20th anniversary of PSC Prapotnik, Velenje	on October 23, Opening of Party Shop in Kolosej, Ljubljana on October 25, charity concert of Lions Club Domžale on October 25, opening of Lumpipark in Mercator Center Tabor, Maribor on October 26. In the days since our previous article, Ula has appeared at Fashion Show Qlandia Maribor on October 17, Lumpi Park in Ljubljana, TEDx event in Celje, Planet Tuš Fest in Celje and Kranj on October 18 and charity concert in Novo Mesto on October 19. In total, her schedule includes not less than 16 performances in a span of 16 days. Yesterday, Ula Ložar was special guest at Slovenian music chart show "Za več slovenske glasbe" with Mare Bačnar on Slovenian Radio 1. 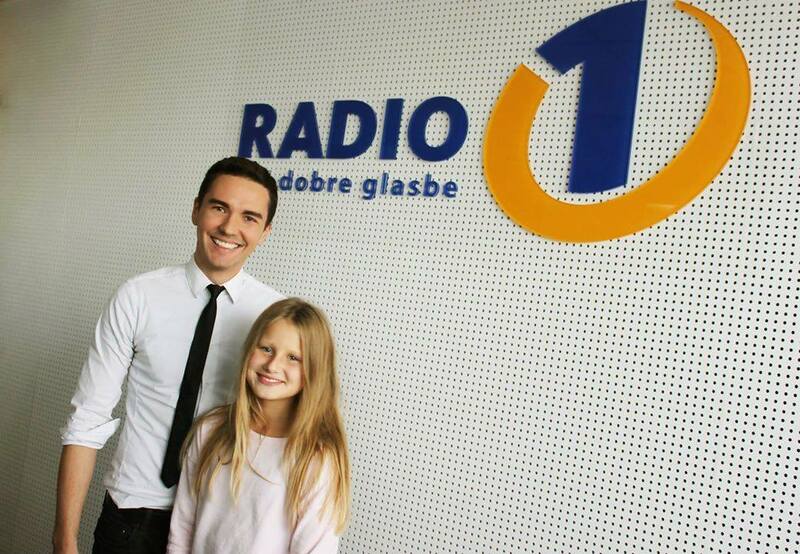 You can listen to the interview with Ula here (starts at 23:30, in Slovenian). Vote for "Nisi sam / Your light" in the chart here (Facebook login required). The recent days have been busy for Ula, who is polishing vocal performance of her song, singing it live at the various events across the country (charity concerts, exhibitions, trade centers etc): Festival "Otroške zvezdice" in Zvezda Park, Ljubljana, October 10, Emporium day, Ljubljana on October 11, Gradevizija 2014 in Kulturni dom Črnuče in Ljubljana on October 11, Fair furniture Ambient, Ljubljana on October 12, Zlato kuhalnico 2014 in Portoroz on October 14, Charity concert in Trata, Škofja Loka on October 15 and others. But she isn't only singing, she has again taken part in the National Schools Cooking competition. Also yesterday Ula had first fitting of her dress for the Junior Eurovision, which so far remains a secret. Ula has received support from such Slovenian celebrities as Regina or Alenka Godec. Here are some recent images from the life of little Slovenian singer, and you can follow all the news on her Facebook page. 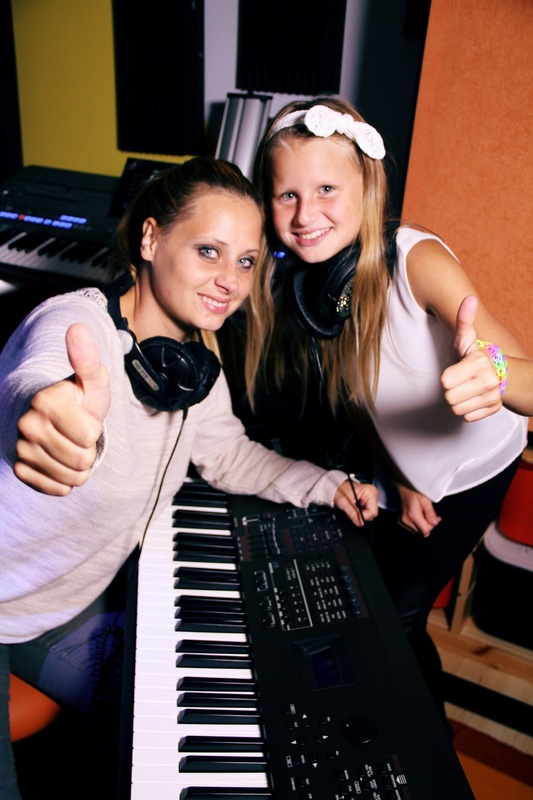 Vocal lessons of Ula with her coach Marjetka Vovk. Watch the music video for "Nisi sam - Your light" here. Also available on Youtube. "A child should remain a child for as long as possible. Ula's image is so nice, simple and clean, so she doesn't require something special on the stage. Ula's vocal is so strong, so we think that showing only the voice will be quite enough. Say we're betting on the voice"
Live: 17.20 CET, NPU (Slovenia), RTVSlo 1, online - presentation of Slovenian entry "Nisi sam - Your light" by Ula Ložar. Check the photogallery from shootings of music video of Ula, that will be presented first on October 5. Video is being filmed by Videoprodukcija KARO Media company (director Nico Karo), which also produced music videos for Slovenian entries in Eurovision 2013-2014. 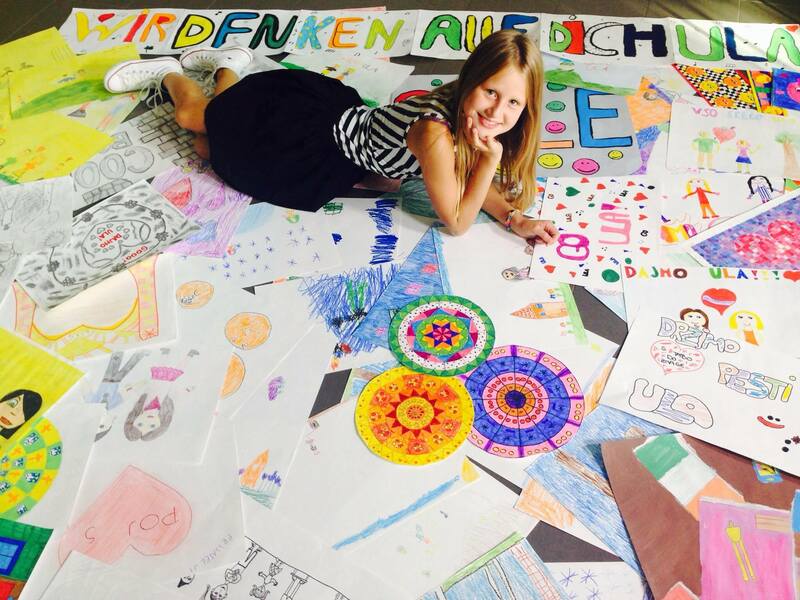 It were kids from primary school "Tone Čufar" in Jesenice that provided more than 400 drawings in support of Ula and wishing her good luck at Junior Eurovision. Interestingly, this school was attended by composer Raay and Ula's grandmother. Some drawings have also been provided by students of Ula's own school "Nove Jarše". These drawings were used in the music video. Entry of Ula Ložar will be presented by TV Slovenia on October 5 in Sunday Afternoon Show NPU to be aired at 17.20 CET. Since her entry is not finished yet, today broadcaster has invited Ula to perform ESC winning song of Marija Šerifović - Molitva. She took part in the morning show "Dobro jutro" together with her mother Klara and vocal coach Marjetka Vovk (wife of composer Raay). According to Ula's posts in social network, her Junior Eurovision entry will be slow, and will have 25% of lyrics in English. "We believe that this is good news and courageous decision and will offer Slovenian viewers a first-class children's festival, and magnificent show in which they will be rooting for their favorite"
National press didn't accept RTVSlo "courageous decision" unanimously positively, for example newspaper "Večer" has noted that a lot of "real" Eurovision fans consider Junior contest to be pretty boring, because it is quite childish, others say that the JESC a sandpit for the children of rich Eastern European oligarchs, and the third note that there must be a reason why majority of countries taking part in adult Eurovision skip on it's Junior equivalent - adding that EBU will have to prove why they still possess enthusiasm to this competition. 12-летняя Ула Ложар (также известная как "Uly Sky") живет в Любляне и занимается в 7м классе школы. Музыка играет особую роль в ее жизни. Она также посещает 4й класс музыкальной школы, где занимается игрой на фортепиано. С 7 лет она берет уроки вокала у профессора Марьетки Вовк в рамках музыкальных семинаров Popsing. Она принимала участие в ряде вокальных мероприятий и конкурсов. Заняла 2е место на школьном конкурсе талантов, участвовала в фестивале "Zlati Mikrofonček" и школьном фестивале "Korajža velja". На фестивале "Europop 2014" в Венгрии она заняла достойное 4е место в своей категории. Планируется, что в 2015 году она примет участие в фестивале Tra la la в Битоле (Македония). Здесь вы можете увидеть, как Ула поет гимн "Зеленых драконов", фанатов люблянского клуба Олимпия. А здесь Ула поет "Hush Hush" The Pussycat Dolls. Еще пару видео можно увидеть здесь. В дополнении к многочисленным конкурсным выступлениям Ула также накапливает опыт работы в студии. Она озвучивает мультфильмы и записала несколько саундтреков. У Улы, как и любого подростка, много хобби. Она любит вязать и вышивать, рисовать картины. Также она любит готовить, и даже принимала участие в кулинарном школьном конкурсе. Ее музыкальные кумиры - Jessie J, Бейонсе, Little Mix и Fifth Harmony, а на прошлом Детском Евровидении ей больше всего понравилась песня Гайи Кауки из Мальты. Все время, когда она слушает музыку, ее очаровывают певицы, которые могут брать самые высокие ноты, и она старается извлекать уроки из их мелодий, поведения на сцене, историй успеха и стиля. Родители Улы полностью поддерживают ее в любых начинаниях. Ула Ложар была выбрана для участия в конкурсах после прохождения прослушиваний, состоявшихся в начале сентября. Об ее участии в конкурсе было официально объявлено 16го сентября. 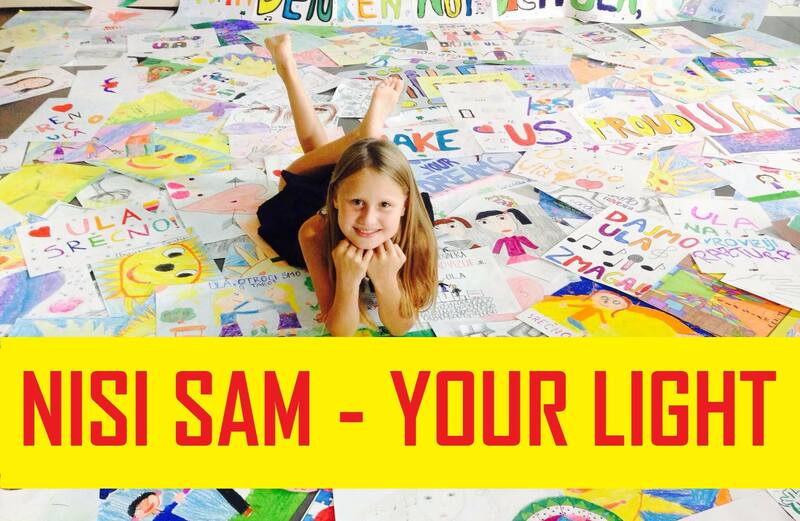 Песню "Nisi sam - Your Light", которую Ула исполнит на конкурсе, и над которой она также поработала как соавтор вместе с Рааем и Марьеткой Вовк (а текст написали Эрика Магер, Люсьен Лончина и Раай), спродюсировал композитор Raay, и она была впервые представлена публике 5го октября на ток-шоу "Nedeljsko popoldne z Ulo". Раай также был автором песни взрослого Евровидения этого года "Spet / Round and Round" Тинкары Ковач. "Болейте за Словению, ведь для нас это первый раз! Я надеюсь, что вы почувствуете смысл, содержащийся в моей песне, даже если вы не сможете понять весь ее текст." - Привет, Ула! Прежде всего наши поздравления с тем, что ты стала представительницей Словении на Детском Евровидении. Мы все видели твою первую реакцию на эту новости, когда тебя захлестнули бурные эмоции. Сейчас ты уже смогла свыкнуться с мыслью, что ты поедешь на Евровидение? - Я с нетерпением жду своего выступления на Детском Евровидении, я очень рада и счастлива тому, что мне выпала такая возможность. Команда телевидения Словении, композитор Раай, педагог по вокалу Марьетка, решили посвятить этот месяц очень усиленной подготовке. Это все довольно сильно выматывает, ведь я хочу быть идеально готовой к конкурсу, и потому мы с моей командой репетируем абсолютно каждый день. Даже когда у меня нет репетиций, я выступаю - на благотворительных мероприятиях, школьных событиях, телепрограммах. Свободного времени в этом месяце у меня нет совершенно. Хотя, конечно, школа не менее важна, чем пение. Но, несмотря на всю усталость, я получаю удовольствие от каждой секунды! Это - бесценный опыт и хорошая подготовка для большой сцены. - Расскажи нам о своей песне "Nisi sam - Your Light", каков ее посыл? - Она о сопереживании, дружбе, любви. И о том, что, на самом деле, мы никогда не остаемся в одиночестве, всегда есть кто-то рядом. О том, как нужно помогать друг другу, и о том, что мы можем надеяться друг на друга в тяжелые времена. - Как она создавалась, принимала ли ты участие в этом творческом процессе? - Мой продюсер Раай и педагог по вокалу Марьетка вовлекли меня в процесс создания мелодии песни. Все происходило следующим образом: я пропевала каждую ноту, и меняла ее немного под себя, так чтобы мы смогли подобрать мелодию и создать песню, которая бы идеально подходила для моего голоса - от низких, до самых высоких нот. Было очень весело так работать над песней, и я чувствую, что я действительно внесла вклад в ее создание. Больше всего мне понравилось делать те части, которые идут после первого припева и вокальную импровизацию. Она полностью придумана мной, и все взрослые были поражены, когда я им предложила так сделать (улыбается). - Это же не было первой твоей работой с композитором Раайем? Над чем вы с ним работали раньше, и, возможно, у вас уже есть какие-то планы на будущее сотрудничество? - Поскольку я занимаюсь в творческой мастерской "Popsing" Марьетки, жены Раая, я принимала участие в небольшом проекте с детской группой и песней "Vprašaj nocoj srce", также я записала с ним около 30 песен для различных мультфильмов. Я очень довольна своей работой с ним. Я никогда и не думала раньше, что сама смогу сочинять мелодию - я не думала, что у меня есть подобный талант, и я была очень впечатлена, как мои учителя вдохновили меня на работу над музыкой и текстом, поэтому я с нетерпением жду любой будущей работы с ними. - Как ты хочешь представить посыл своей песни в сценической постановке? Будут ли с тобой выступать какие-то бэк-вокалисты/танцоры? - Нет, я буду одна на сцене. Я привыкла выступать одна, и моя песня довольно минималистична и при этом современна, и все лишнее на сцене (танцоры или какие-то декорации) просто уничтожат эту современность и те чувства, которые несет моя песня, отвлекут от нее и моего пения. Мне кажется, что когда песня достаточно сильная, вокруг нее не стоит устраивать цирк, я сама не большая поклонница подобных театрализованных выступлений - когда я сама выступаю, конечно. - А выбрали ли вы уже твой сценический костюм? Каким ты хочешь, чтобы он был - повседневным, или каким-то особенно ярким? - Ты будешь первой представительницей Словении на этом конкурсе, но мы слышали, что ты видела несколько прошлых шоу, что тебе из них запомнилось? - Я мельком просмотрела несколько прошлых конкурсов, и мне кажется, что этот год - наиболее сильный, с лучшими песнями. Специально я посмотрела прошлогоднюю победительницу с Мальты, у Гайи такой потрясающий голос, мне она очень понравилась! - Ты же встречалась с Тинкарой Ковач, давала ли она или какие-то другие прошлые представители Словении на взрослом Евровидении тебе советы для детского конкурса? - Ты обычно нервничаешь, прежде чем выйти на сцену, как ты успокаиваешь себя? - Когда я на сцене, меня переполняет энергия, исходящая из зрительного зала. Я успокаиваюсь с помощью этой позитивной энергии. Только лишь когда я пою песню, которую я только что выучила, впервые - это действительно ужасно страшно. - Тебя интересует, кто представит на конкурсе другие страны, будешь ли ты слушать других участников? - Да, я слушаю их сразу после выхода, в настоящее время я жду оставшихся стран, пока не показавших свои песни. - А какую ты ставишь перед собой цель на конкурсе? - Для меня он станет прежде всего огромным опытом, и важной рекомендацией для будущего участия в различных фестивалях. Потому, моя задача - подготовиться к нему не на 100%, а на все 200%. - Что ты бы назвала своим наивысшим достижением на сегодня, помимо Евровидения? - Помимо того, что меня выбрали для Детского Евровидения, я считаю хорошим результатом 4е место в своей категории в фестивале EUROPOP, который проходил в этом году в Венгрии. - Из чего состоит твой другой музкальный репертуар? Есть ли в нем еще оригинальные песни? - Это зависит от того, как я чувствую себя в день выступления. Для меня важнее всего получать удовольствие от песни, чтобы она хорошо подходила к моему голосу, и той манере пения, которую я стараюсь развивать у себя. - Сложно ли тебе совмещать подготовку к конкурсу с занятиями в школе? Любишь ли ты учиться? - Всегда для совмещения чего-либо требуется много усилий. Если говорить честно, я не могу сказать, что прямо с огромным удовольствием хожу в школу, но я хорошо учусь, всегда делаю все домашние задания, и у меня хорошие оценки. Требуется хорошо работать на всех уровнях - и в музыке, и в школе, даже если эта работа не всегда представляет собой чистое удовольствие. - Похоже, что у тебя очень много разных хобби. Ты рассматриваешь какую-то другую карьеру в будущем, кроме пения? - Мне очень нравится вышивать тамбуром, и я надеюсь, что однажды я смогу открыть магазин с вышитыми изделиями. Также мне очень нравится рисовать, хотя я и не думаю, что мои картины когда-то кто-то захочет купить. Некоторые говорят, что у меня талант к абстрактной живописи, но если я решу нарисовать что-то из реальной жизни, например машину, то не уверена, что ее многие узнают. - Спасибо тебе за интервью, удачной подготовки и до скорой встречи на Мальте! Перед вылетом на Мальту, 8го ноября Ула примет участие в телешоу "Moja Slovenija" на телеканале RTVSlo1, начало в 20:00 местного времени. Там она впервые представит публике полностью словенскую версию своей конкурсной песни. Смотрите видео здесь. Также на следующей неделе в записи выйдут еще две программы с участием Улы: 10го ноября в 20:00 "Tednik" и 14 ноября в 20:00 "Slovenski pozdrav". Свежий репортаж RTVSlo о подготовке Улы к конкурсу вы можете увидеть здесь. Тем временем, одноклассники Улы украсили школу, где она занимается приветствиями и пожеланиями ей успеха на Мальте. "Я репетирую свою песню каждый день. Мы занимаемся с Марьеткой Вовк, мы анализируем, и стараемся исправить те моменты, которые пока удаются не очень хорошо. Мы понимаем друг друга очень хорошо", говорит Ула в своем новом интервью словенскому сайту Евровидения Evrovizija.com. Она говорит, что постарается расслабиться во время выступления. "Если я успокоюсь, то чувствую себя хорошо. Перед выступлением я могу немного бояться, но попадая на сцену я забываю все свои переживания. Небольшая боязнь сцены должна присутствовать в любом случае. Но это зависит от уровня выступления. Перед национальными выступлениями я не так волнуюсь. Я помню, что один раз, когда я пела на сцене, под которой была вода, то я посмотрела на воду и успокоилась. Это мне помогло. С того времени я всегда стараюсь представить себе воду, чтобы успокоиться. Прежде всего, я немного была испугана, что мне придется выступать на сцене одной. Но потом взрослые рассказали мне, как что будет. Я пообщалась с опытными исполнителями. И сейчас я не могу дождаться выхода на сцену для большого выступления". "Мой костюм приготовит Весна Миртель или Vesnish. Сейчас у нас есть две идеи, обе из которых мне очень нравятся, и я сама не могу определиться. Мы потом решим вместе с Марьеткой, Раайем и командой Словенского телевидения. Однако, я не хочу, чтобы платье считалось самым важным моментом. Я хочу, чтобы люди слушали прежде всего мой голос и мою песню"
Словенская делегация отправится на Мальту 9го ноября. 2го ноября Ула Ложар вновь примет участие в программе NPU на канале RTVSlo 1, которую ведет Ула Фурлан, где впервые исполнит на телевидении вживую свою конкурсную песню "Nisi sam / Your light". Она также сможет встретиться и пообщаться с представительницей Словении на Евровидении 1995 и 1999 года Дарьей Швайгер, которая тоже будет гостьей в шоу. Шоу выходит в эфир с 17:20 по 18:40 местного времени и за ним можно следить в прямом эфире здесь. Видео выступления Улы вы можете увидеть здесь (начинается в 1:12:00) или здесь. Небольшой клип выступления Улы на Študentska arena в Любляне. Вы можете найти полное расписание выступлений Улы на ее Facebook странице. Далее по плану ее ждет выступление на открытии обновленных залов и 20-летней годовщине PSC Prapotnik, Веленье, 23го октября, открытие Party Shop в Kolosej, Любляна, 25го октября, благотворительный концерт Lions Club Домжале 25го октября, открытие Lumpipark в Mercator Center Tabor, Марибор - 26 октября. С момента публикации нашей предыдущей статьи, Ула выступила на шоу мод Qlandia в Мариборе 17го октября, Lumpi Park в Любляне, мероприятии TEDx в Целе, Planet Tuš Fest в Целе и Крани 18 октября, и благотворительном концерте в Ново Место 19 октября. Всего ее программа включает в себя не менее 16 выступлений на протяжении 16 дней. Вчера, Ула Ложар стала специальной гостьей словенского музыкального чарта "Za več slovenske glasbe" с Маре Бачнаром на Словенском Радио 1. Запись интервью с Улой вы можете услышать здесь (начало в 23:30, на словенском). Голосуйте за "Nisi sam / Your light" в чарте здесь (требуется Facebook логин). Последние дни были у Улы были очень занятыми - она продолжает оттачивать вокальное исполнение песни, представляя ее на различных мероприятиях по стране (благотворительные концерты, выставки, торговые центры и др): Фестиваль "Otroške zvezdice" в Zvezda Park, Любляна, 10 октября, Emporium day, Любляна, 11 октября, Gradevizija 2014 в Kulturni dom Črnuče в Любляне 11 октября, Ярмарка мебели Ambient, Любляна, 12 октября, Zlato kuhalnico 2014 в Портороже 14 октября, благотворительном концерте в Trata, Škofja Loka 15 октября, и др. Но она не только поет - она еще и вновь приняла участие в Национальном Школьном Кулинарном конкурсе. Вчера у Улы пришла первая примерка ее платья для выступления на Детском Евровидении, которое пока держится в секрете. Ула получила поддержку от таких словенских звезд, как, например, Регина или Аленка Годец. Вот несколько свежих фотографий из жизни маленькой словенской певицы, а за всеми новостями о ней вы можете следить на ее Facebook странице. Занятия по вокалу Улы с ее педагогом Марьеткой Вовк. Видеоклип на песню "Nisi sam - Your light" вы можете увидеть здесь. Также доступно на Youtube. "Ребенок должен оставаться ребенком так долго, как это возможно. Ула - милый, простой и чистый ребенок, и ей не требуется что-то особенное на сцене. Ее голос такой сильный, поэтому я думаю, что показать только его, будет вполне достаточно. Можно сказать, мы делаем ставку на голос"
Прямой эфир: 19.20 Москвы, NPU (Словения), RTVSlo 1, онлайн - презентация словенской песни "Nisi sam - Your light" в исполнении Улы Ложар. Фотогалерея со съемок видеоклипа Улы, который будет впервые представлен 5го октября. Съемки ведет компания Videoprodukcija KARO Media (режиссер Нико Каро), которая также производила видеоклипы Словении для взрослого Евровидения 2013-2014 годов. Ученики школы "Tone Čufar" в Есенице нарисовали свыше 400 рисунков в поддержку Улы, желая ей успеха на Детском Евровидении. Интересно, что в этой школе в свое время занимались композитор Раай и бабушка Улы. Несколько рисунков также было нарисовано учениками школы самой Улы "Nove Jarše". Все эти рисунки были использованы в видеоклипе. Песня Улы Ложар будет представлена Словенским телевидением 5го октября в воскресной программе NPU, которая выйдет в эфир в 19.20 Москвы. Поскольку ее песня еще не завершена, сегодня телевещатель пригласил Улу исполнить песню Марии Шерифович "Молитва", с которой она одержала победу на Евровидении 2007. Ула приняла участие в утренней программе "Dobro jutro" вместе со своей мамой Кларой и педагогом по вокалу Марьеткой Вовк (женой композитора Раая). По словам Улы в одной из социальные сетей, ее песня будет медленной, и будет содержать 25% текста на английском языке. "Мы полагаем, что это хорошие новости и храброе решение, и мы предложим зрителям Словении детский фестиваль первого класса, великолепное шоу, в котором они смогут поддержать своего фаворита"
Национальная пресса не восприняла "храброе решение" RTVSlo единогласно положительно, например газета "Вечер" отметила, что большинство поклонников "настоящего" Евровидения считают его детский аналог довольно скучным, поскольку он слишком "детский", другие говорят, что Детское Евровидение - это песочница для развлеения детей восточно-европейских олигархов, а третьи отмечают, что не без причины основная часть стран, принимающих участие во взрослом Евровидении отказываются от его детского эквивалента - добавив, что ЕВС придется потрудиться, чтобы доказать, почему они до сих пор с энтузиазмом относятся к проведению данного конкурса. So I can squeeze it firmly. And I can see the light, your light. And I'm ready to be an angel, oh, your angel. If you let it burn. But I don't want you to run away. Because together it is easy. For people who cannot reach for the stars. And I am offering you this smile of mine. You know you are never really alone.